This experiment introduces the Analog Discovery's™ arbitrary waveform generator instrument. Arbitrary waveform generators, often called AWGs or simply waveform generators, produce a variety of time-varying signals. Most, including the Analog Discovery's AWG, will also produce a constant voltage. This constant voltage level is typically variable, unlike the fixed voltage produced by the Voltage instrument. Most voltages produced by waveform generators are periodic. This means that they repeat themselves at a set rate. This rate is called the frequency of the signal, which is the number of times that the signal repeats itself each second. Units of frequency are cycles per second, or Hertz (abbreviated Hz). For more info on periodic signals, follow the link provided in the related materials section. In this experiment, we will use the AWG to apply a time-varying signal to an LED to make it flash on and off. This will allow us to explore some of the features of the waveform generator and get a physical feeling for some of the parameters associated with periodic signals. Be able to identify ground, W1, and W2 terminals on Analog Discovery. Determine the frequency of a periodic signal from a plot of the signal as a function of time. 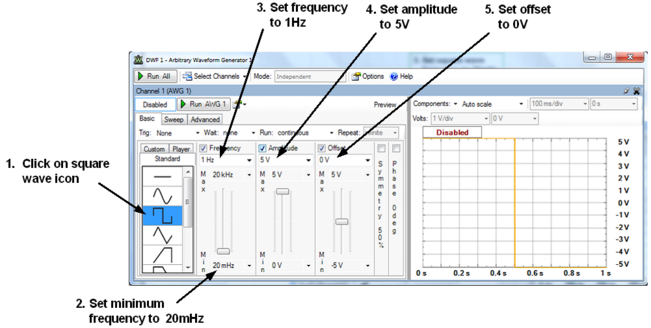 Be able to use the Analog Discovery waveform generator to apply constant voltages. 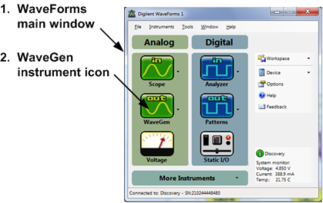 Be able to use the Analog Discovery waveform generator to apply standard periodic voltage signals. 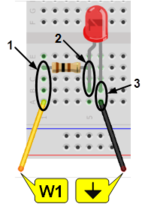 If you have completed the Voltage Instrument project and your circuit is still intact, just replace the V+ connection (the red wire) with the W1 connection (the yellow wire) as shown in Step 1 of this project. 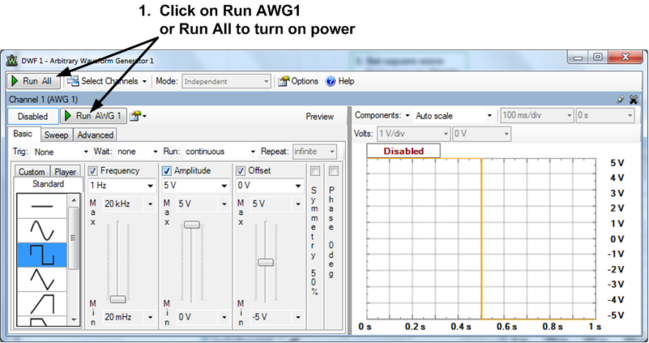 Then open the WaveGen instrument and apply power to the circuit, per Step 2 of this exercise. 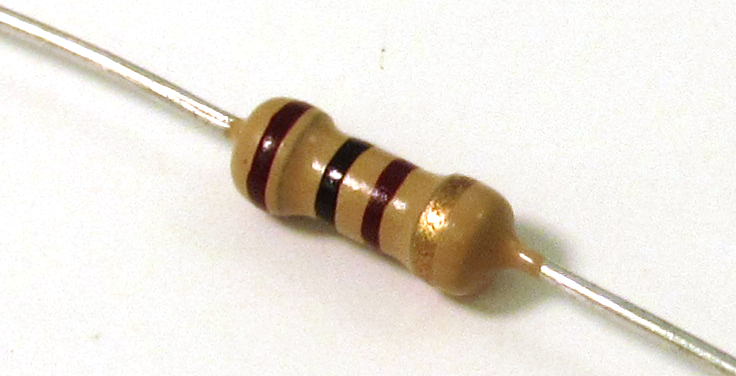 Use W1 to apply voltage across the LED to make it “flicker”. Connect W1 (the yellow wire) to the resistor. 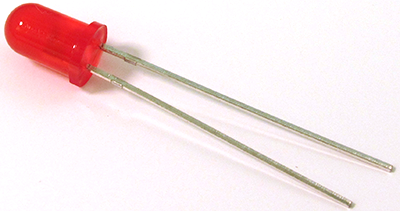 Connect the resistor to the LED anode. Connect ground ( , the black wire) to the LED cathode. The LED should blink on and off. Our input frequency is 1Hz (one cycle/second), so it should turn on once per second. The default square wave provides high voltage for half the overall cycle and low voltage for the other half, so the LED should be on for a half second and off for a half second. Vary the frequency between about 100mHz and 100Hz and find out at what frequency the diode seems to be on all the time. Decrease the amplitude and determine the voltage at which the LED no longer turns “ON”. Try sinusoidal ( icon), triangular ( icon), and constant ( icon) voltages. What effect does this have on the LED's flicker? Return to a 1Hz square wave with a 5V amplitude. Click on the Symmetry check box. This option allows you to change the relative “ON” and “OFF” times for the LED. Change the symmetry to 10%. Does this have the effect you would expect? If you have a set of headphones, plug them into the headphone jack in the back of the Analog Discovery. Use the waveform generator to create a sinusoidal signal with a frequency of about 100Hz and a 2V amplitude. Listen to the resulting tone with your headphones. Vary the frequency and amplitude of the sinusoid. Over what range of frequencies can you hear the tone? Does changing the amplitude have the effect you expect?